Women's Refined Slim Fit Rain Boots is rated 4.1 out of 5 by 31. Version encore plus ajustée, idéale pour la vie urbaine, la botte haute Wellington raffinée est taillée sur mesure pour une coupe plus cintrée et comporte moins de couches de caoutchouc naturel, assurant ainsi une sensation de légèreté accrue. 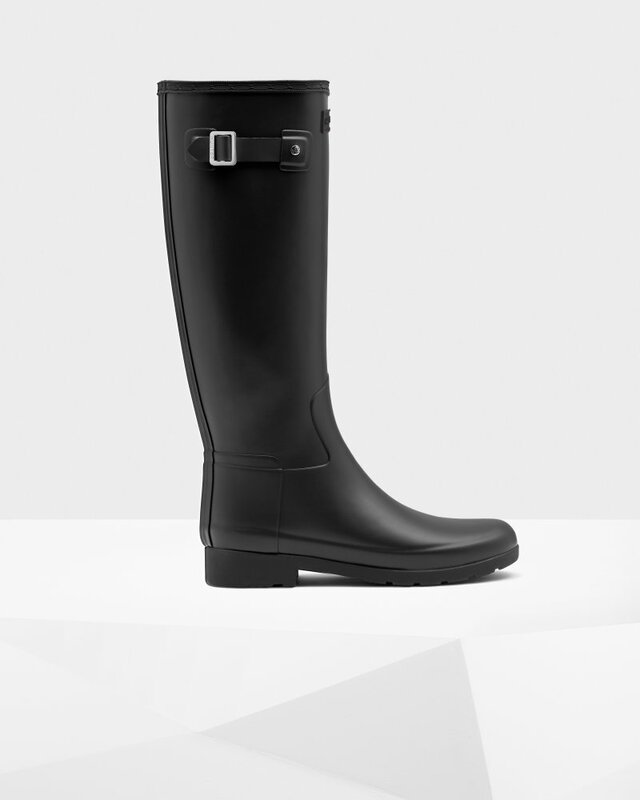 Fabriquée à la main et entièrement imperméable, cette Wellington pour femme au fini mat classique allie fonctionnalité et style, pour une allure chic par temps de pluie. Rated 3 out of 5 by Suzy from Lovely colour I'm a size 7.5 and have very flat feet. I am 5ft 4in tall. Purchased the size 8 which fit my feet just about right. Other than the look, that's about as good as it gets. It's heavy, goes up way too high so it makes it uncomfortable around my knees and it also rubs the tops of my feet. I had purchased the size 7 before as some reviews said it was coming up big but this was not the case although it fit more comfortably under the knee. It's looks nice but my Canadian Tire rain boots are way more comfortable. Rated 4 out of 5 by Flygirl from Fab boots Loved the colour of this boot and I liked them slimmer look. This boot is too narrow to wear with the socks. Being only 5”4’ if found it a little to close to the knee when you sit down it digs in the back of my leg. But I still like them I have a jacket the matches them. Rated 4 out of 5 by cinimangirl from Nice boot Bought the boots a few weeks ago and have been wearing them almost everyday. Nice clean and simple profile and easy to wear for a rubber boot. Really like them. Just make sure you have a slim ankle/leg before considering this boot, as the ankle portion is definitely a slim fit. Rated 3 out of 5 by TracyNT from Not very comfortable You will need time to get use to these boots. They're quite uncomfortable and it's impossible to drive in them. They're def water proof if that's all you're looking for. Rated 5 out of 5 by StephieR from Amazing fit I got these 2 months ago and I’ve been wearing them everyday! I wear them in winter even! Rated 4 out of 5 by ballison from Beautiful colour! I love my oxblood coloured boots. They are gorgeous and fit perfect. True to size. Rated 3 out of 5 by hollipej from Slim fit I was excited to get these boots and I really love the slim fit. After wearing them for a weekend, I noticed that the colour was changing in a couple of spots...like the material is fatiguing. Rated 1 out of 5 by RachelG from Too slim Sadly, I regret purchasing these boots. I have a pair of originals that I adore but are quite wide, especially around the calf, so I opted for the slim ones this time. The calf shaft is perfect size but the feet are extremely narrow and I can't wear them for long before my feet hurt.